Bengaluru FC have added mettle to their midfield by signing midfielders Harmanjot Khabra and Lenny Rodrigues. 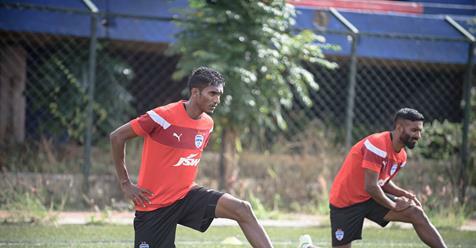 Both the players join the Blues on a season long loan deal from their respective Indian Super League(ISL) clubs they are currently contracted with. 28 year old Chennaiyin FC midfielder Harmanjot Khabra, on loan from is known for his exceptional work rate and versatility in different positions. The former East Bengal player who has the ability to play even in the defence was thankful to Bengaluru FC to pick him and also mentioned his desire to play alongside Sunil Chhetri and Eugeneson Lyngdoh. The signing of FC Pune City's Lenny Rodrigues is expected to add more solidity to the Bengaluru FC's midfield. The Indian International midfielder is a very reliable figure in the middle of the park. Standing at 6 feet 1 Inch tall, the former Churchill Brothers, Dempo SC and Mohun Bagan mideo boasts a good vision and comes with a great composed head to dictate the heart of the midfield. Apart from defending the I-League Bengaluru FC will be battling it out in the AFC Champions League play-offs also where they will face Al-Wehdat.